Resident physician David Poulsen (sitting) teaches microsurgical suturing skills to fellow resident Gabriel Rand. 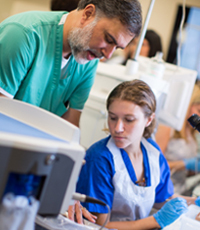 Medical students are frequently involved in the department’s research efforts, many of which utilize the advanced equipment available in the wetlab itself. Montefiore Health System and the North Bronx Healthcare Network are dominant healthcare presences within the borough. Patient volume and surgical demand from our patient population have historically ensured that residents meet surgical requirements without difficulty at our own institution. Director of Retina, Umar Mian, MD (left) and resident physician Juliana Gildener-Leapman (right) inspect the ultrasound probe used in cataract surgery. In the foreground, one of the several phacoemulsification machines sits primed for a mock cataract surgery. Though all of the surgeries in the wetlab are for practice, all of the phacoemulsification machines are fully functional and operating-room ready. The wetlab boasts multiple phacoemulsification systems, many of which are the standard in many operating rooms today. Providing residents with modern and realistic practice tools translates to better preparation for the operating room and superior patient care. 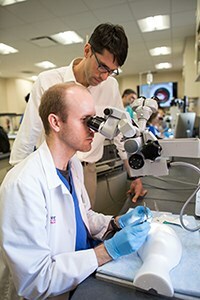 Current Department of Ophthalmology and Visual Sciences Residency Program Chair, Roy Chuck, MD, has spearheaded a period of unprecedented expansion with the opening of multiple eye clinics and the addition of a new dedicated ophthalmology ambulatory surgery center at Montefiore’s Westchester Square Campus. Our Westchester Square location has facilitated a growth in surgical volume for resident physicians who work there as primary surgeons nearly every day of the week. The Ronald M. Burde, MD Surgical Simulation Laboratory was established in 2013 under the leadership of Anurag Shrivastava, MD. The Center provides residents with access to one of the most advanced ophthalmic surgical training facilities in the country. The laboratory is available 24/7, and allows residents the ability to perform entire cataract procedures in a highly realistic simulated environment. Multiple phacoemulsification units are permanently housed in the laboratory alongside teaching and training stations that are each equipped to display and record surgical videos on 27" IMac computers. 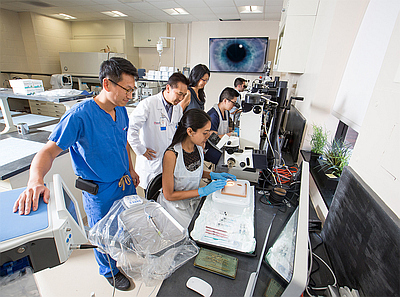 The Laboratory allows residents an endless opportunity to improve surgical skills well before operating on a live human eye. The facility continues to undergo renovation and expansion, and serves as a community educational resource laboratory. (Left to Right) Director of Refractive Surgery Jimmy K. Lee, MD and Department of Ophthalmology and Visual Sciences Chairman Roy S. Chuck, MD gather to share cataract surgery techniques with a resident at a Kitaro DryLab station. There are eleven Kitaro DryLab kits each with a dedicated set of instruments to practice with.